tested, with quick shot option. Two fire buttons. See the Photo. The translation of human will into machine movement via a single stick may be one of the most overlooked achievements of the last 100 years. "I would say that it was the 20th century's distinctive contribution to the interface between people and machines," said Mr. Tenner, who is author of Our Own Devices: How Technology Remakes Humanity. The joystick is one of the most popular input device used by gamers and simulators. It aids to create a more realistic experience for flight simulators and navigation within programs. 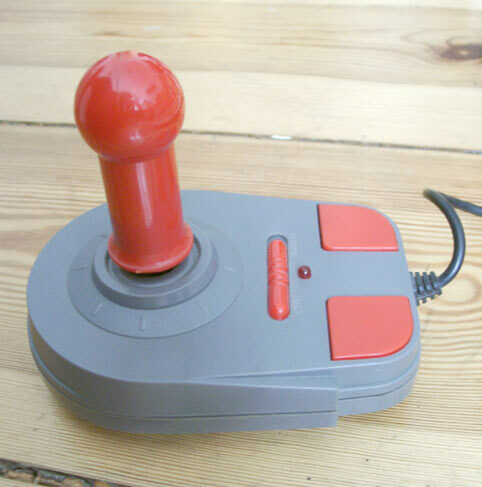 Originating from the Atari game system, digital joystick consisted of 5 different functions: Up, Right, Left, Down, and a fire button. The joystick's connector had a 9 pin D Shell connector which helped the joystick input and output the information from the direction the stick is moved. Getestet, mit Quickshot Option. Zwei Feuer Buttons. Buy now for 28 € with PayPal, shipping cost within EU are included. All other buyers please contact me. Jetzt Kaufen für 18 € mit PayPal, die Versandkosten innerhalb Deutschlands sind enthalten.